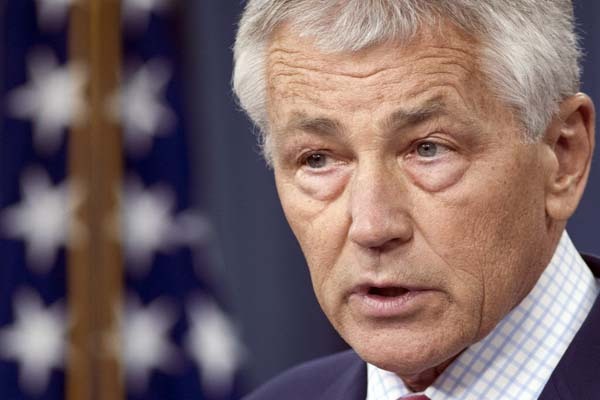 U.S. Defense Secretary Chuck Hagel hopes to finalise a major arms deal with Saudi Arabia and the United Arab Emirates during a visit to the Middle East this week, and also discuss fresh military supplies to Israel, an Israeli official said on Friday. The accord is worth $10 billion and will help the three countries counter any threat from Iran, the New York Times reported. Hagel arrives in Israel on April 20, where he will discuss the civil war in neighbouring Syria and Iran's contested nuclear programme. He will later hold talks in Jordan, Saudi Arabia, Egypt and the United Arab Emirates. Asked to comment on the New York Times report, an Israeli official confirmed that Washington "wants to close a major arms deal" with the Saudis and the UAE, and also "wants to preserve Israel's qualitative edge, in parallel". He said Israel was weighing a U.S. offer to sell it missiles designed to take out air-defence radars, advanced radar systems for warplanes, refuelling tanker planes and a guided munitions system, about which the official would not elaborate. These systems would be paid for with U.S. defence grants, the Israeli official said. Israel is the largest single recipient of U.S. foreign aid, with military assistance expected to total upwards of $3 billion for the current fiscal year. The New York Times said that while Washington wanted to improve Israeli capabilities it did not want to seem to be endorsing any "accelerated planning" by Israel to launch a unilateral strike against Iranian nuclear facilities. Hagel's visit to Israel follows a trip to Israel by President Barack Obama last month and three visits in quick succession by U.S. Secretary of State John Kerry, who is looking to revive long-stalled Israeli-Palestinian peace talks.